December 7, 2012, filed under PETITION, Vigil For Gaza; No Comments. It’s up to the people themselves to begin to build bridges for peace. Listen to the people with the positive message, not the ones speaking with the voice of fear. Sometimes we have to take a chance, and we may get hurt. But what is life worth – if we allow ourselves to be manipulated and controlled – in order for our misery to continue? We are all free people. Born free, to be the people we are meant to be. It is a bigger plan than what we understand, but one that is good. Don’t allow your life to be side-tracked by hate. The future has to be built on peace and peaceful intent. A story about social change. The Japanese monkey, Macaca Fuscata, had been observed in the wild for a period of over 30years. In 1952, on the island of Koshima, scientists were providing monkeys with sweet potatoes dropped in the sand. The monkey liked the taste of the raw sweet potatoes, but they found the dirt unpleasant. An 18-month-old female named Imo found she could solve the problem by washing the potatoes in a near by stream. this new way and they taught their mothers too. Between 1952 and 1958, all the young monkeys learned to wash the sandy sweet potatoes to make them more palatable. social improvement. Other adults kept eating the dirty sweet potatoes. DO WE REALLY WANT TO KEEP EATING DIRTY SWEET POTATO WHEN WITH A LITTLE EFFORT WE CAN ENJOY IT CLEAN? 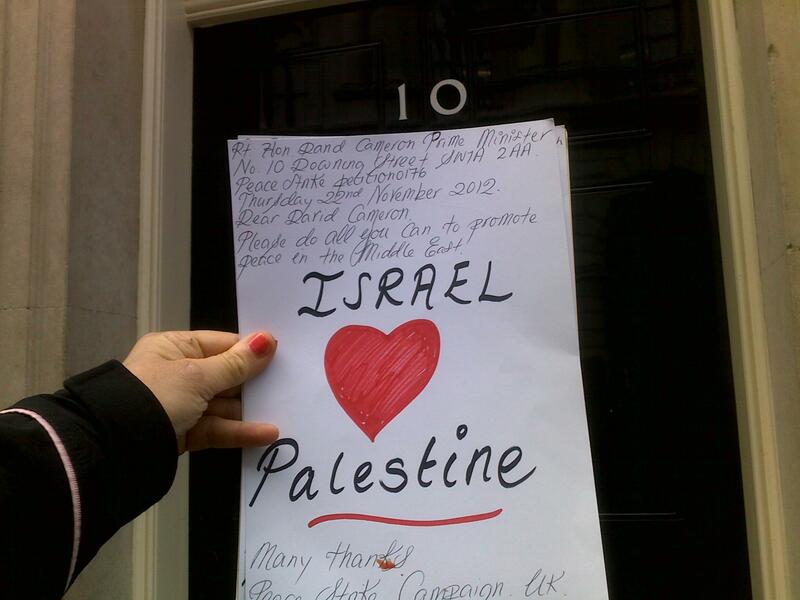 November 15, 2012, filed under Vigil For Gaza; 2 Comments. June 1, 2010, filed under On Strike for Peace, Vigil For Gaza; No Comments. Show your support for the Palestinian people during this very difficult time. Peaceful vigils are very powerful if we have enough people united together for peace. 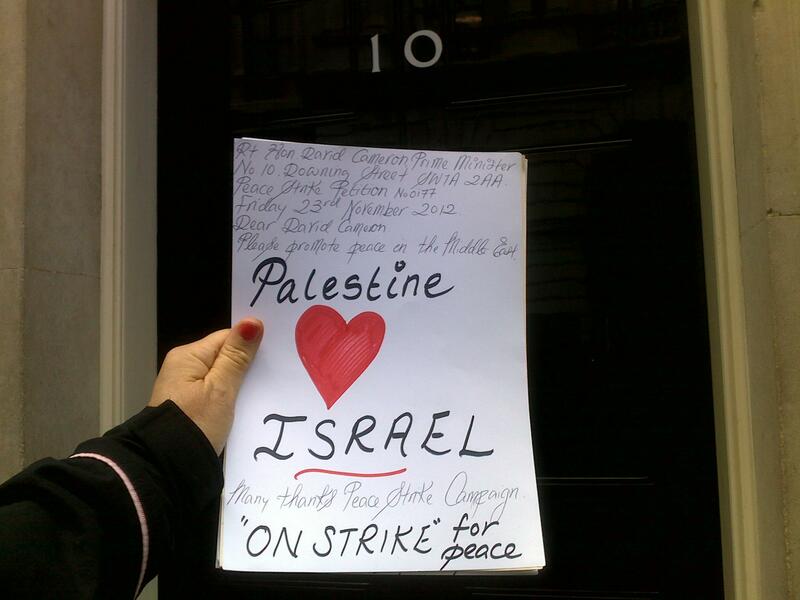 February 4, 2009, filed under On Strike for Peace, Vigil For Gaza; No Comments. February 2, 2009, filed under Vigil For Gaza; No Comments. Maria Gallastegui, who has been on hunger strike for over 3 weeks opposite the Houses of Parliament in London to protest against the situation in Gaza, will protest at the Prime Minister’s door on Tuesday 3 February at 11.30am. Maria started the hunger strike on the 12 January – the day that MPs and Lords returned to Parliament – and has been taking in only liquids since. There is a large banner opposite Parliament displaying the number of days the hunger strike has continued. On Tuesday morning, Maria will, for the fourth week since she started the hunger strike, take her demands to 10 Downing Street at the same time as Ministers assemble for the Cabinet meeting. She will personally deliver a petition to the Prime Minister. January 26, 2009, filed under Vigil For Gaza; No Comments. This Tuesday, Maria Gallastegui will be on the 16th day of her hunger strike opposite the Houses of Parliament protesting against the situation in Gaza. She will be personally taking her demonstration and demands up to 10 Downing Street at 8.30am as Ministers arrive for the Cabinet meeting. Maria says, “The hunger strike is an act of protest to highlight the unacceptable atrocities perpetrated on the people of Gaza. The Israeli forces have deliberately targeted civilians, have used ‘White Phosphorus’, and are suspected of using depleted uranium, which will have devastating effects for decades to come. As with the attack on Lebanon in 2006, there has been total disregard for human life. The civilians must now struggle to survive in the wreckage. A ceasefire may be in place but we demand an end to the blockade that has made life for people in Gaza so difficult for two years, an end to the sale of arms to Israel by the UK government and that those who committed these war crimes are held responsible and punished. Watch a short film taken on day 5 of Maria’s hunger strike. January 12, 2009, filed under Vigil For Gaza; No Comments. A continuous Vigil for Gaza started in Parliament Square on Thursday 8 January to to call for an immediate end to Israel’s military assault on Gaza and an end to the blockade and siege on Gaza. The vigil is supported by the Peace Strike. Please come and join the vigil whenever you can. See http://www.vigilforgaza.net here for more details.